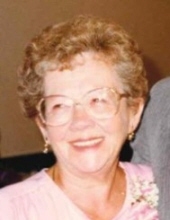 Marian Lee Snowman, 90, of Belfast, passed away April 11, 2019 at Waldo County General Hospital. Her loving family was at her side. She was born July 23, 1928 in Columbia, Maine, the daughter of Millard and Lovie Grant. Marian graduated from high school in Corinna, Maine in 1947. She then attended nursing school in Bangor at Eastern Maine General Hospital and graduated in 1950. Marian worked as an RN at Waldo County General Hospital for many years and retired in 1990. Marian was predeceased by her parents; her husband Gilbert Snowman; Sisters Erma Maxim, Madelyn Leighton, Muriel Lovejoy; and brothers Arnold Grand and Roger Grant. She is survived by children Alan Caler and wife Susan of North Berwick, Lynn Caler and wife Shirley of Waldo, and Sally Kemp of Largo, Florida; grandchildren Nicholas, Audra, Mallory, Chelsea, Jenna, Grant, Spencer and Gavin; great-grandchildren Laiken, Kinsley, Theo, Asher, Milande and soon to be born, Liliana. In lieu of flowers, donations may be made in Marian’s name by logging into maineaudubon.org and clicking the donate button. A memorial service will be held at a later date. Arrangements are under the care of Riposta Funeral Home, Belfast. Memories and condolences may be shared with the family at Ripostafh.com. To send flowers or a remembrance gift to the family of Marian Lee Snowman, please visit our Tribute Store. "Email Address" would like to share the life celebration of Marian Lee Snowman. Click on the "link" to go to share a favorite memory or leave a condolence message for the family.